The PPRC identifies Hoelen (Fu Ling) to be the dried sclerotium of Poria cocos (Schw.) Wolf (Fam. Polyporaceae). The nature of Hoelen is neutral, its flavor is bland and sweet, and it homes to the Heart, Lungs, Spleen, and Kidney channels. Its functions include inducing diuresis to drain dampness, leaching dampness, strengthening the Spleen and claming the Heart. It is commonly used to treat edema with scant urination, phlegm-rheum with palpitations, spleen deficiency and poor appetite, and restless Heart and spirit, as well as fright palpitations and insomnia. Ginseng (Ren Shen, 人參), White Atractylodes (Bai Zhu, 白朮), and Licorice (Gan Cao, 甘草) strengthen the spleen and augment Qi. 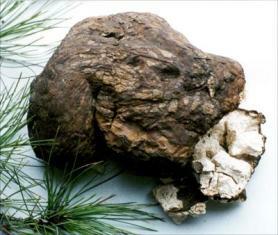 Dioscorea (Shan Yao, 山藥) and Lotus Seed (Lian Zi, 蓮子肉) augment the Spleen Qi, nourish Spleen Yin, and arrest diarrhea. Dolichos (Bai Bian Dou, 白扁豆), Hoelen (Fu Ling, 茯苓), and Coix (Yi Yi Ren, 薏苡仁) strengthen the Spleen and eliminate dampness. Cardamom (Suo Sha Ren, 縮砂仁) regulates the flow of Qi, transforms dampness, and prevents stagnation that may be caused by Qi tonics. Platycodon (Jie Geng, 桔梗) directs Spleen Qi upward, transports nutrients to the Lungs, and prevents Lung deficiency (reinforcing the earth to generate the metal). It also leads the effects of other ingredients upward, facilitates Lung Qi to help spread nutrients throughout the body and arrest diarrhea. Tonifies Qi, strengthens the Spleen, eliminates dampness, and arrest diarrhea. Traditional: Spleen Qi deficiency with damp accumulation marked by lack appetite; fatigue; shortness of breath; abdominal distention; hiccup; borborygmus; vomiting; diarrhea; pale complexion; a pale tongue with white coating; and a thready, moderate, or forceless pulse. Modern: Chronic gastroenteritis, chronic diarrhea, intestinal tuberculosis, chronic colitis, dysfunction of the gastrointestinal tract, gastroptosis, leukorrhea, chronic hepatitis, chronic nephritis, chronic sinusitis, and the side effects caused by chemotherapy or radiation. Vladimiriae (Chuan Mu Xiang, 川木香) and Cardamom (Suo Sha Ren, 縮砂仁) regulate the flow of Qi, harmonize the Stomach, and alleviate abdominal pain. Six Major Herb Combination (Liu Jun Zi Tang, 六君子湯), consisting of Ginseng (Ren Shen, 人參), White Atractylodes (Bai Zhu, 白朮), Hoelen (Fu Ling, 茯苓), Licorice (Gan Cao, 甘草), Pinellia (Ban Xia, 半夏), and Citrus Peel (Chen Pi, 陳皮), augments Qi, strengthens the Spleen, dries dampness, and transforms phlegm. Strengthens the Spleen, augments Qi, harmonizes the Stomach, regulates the flow of Qi, and alleviates pain. Traditional: Spleen and Stomach deficiency with the retention of dampness in the middle warmer, marked by poor appetite, fullness and distention in the epigastrium and abdomen, belching, nausea, vomiting, diarrhea, and abdominal pain. Modern: Chronic gastroenteritis, bile-regurgitational gastritis, gastroptosis, gastroatonia, peptic ulcer, chronic peritonitis, carcinoma of the stomach, morning sickness, chronic nephritis, lack of appetite following an illness, and a weak constitution in elderly patients. Ginseng (Ren Shen, 人參) and Astragalus (Huang Qi, 黃耆) strengthen the Spleen and tonify Qi to generate the blood. White Atractylodes (Bai Zhu, 白朮), Chinese Angelica (Dang Gui, 當歸), and Longan (Long Yan Rou, 龍眼肉) tonify the blood and nourish the Heart. Polygala (Yuan Zhi, 遠志), Zizyphus (Suan Zao Ren, 酸棗仁), and Hoelen (Fu Ling, 茯苓) nourish the Heart and calm the spirit. Vladimiriae (Chuan Mu Xiang, 川木香), Jujube (Da Zao, 大棗), Fresh Ginger (Sheng Jiang, 生薑), and Licorice (Gan Cao, 甘草) harmonize the Stomach and strengthen the Spleen. Augments Qi, tonifies the blood, strengthens the Spleen, and nourishes the Heart. Traditional: Deficiency of both the Heart and Spleen caused by deficiency of Qi and the blood due to over-thinking and worries, marked by pale or sallow complexion, palpitation, poor memory, insomnia, night sweating, deficiency heat, reduced appetite, fatigue, lassitude, a pale tongue with thin white coating, and a thready and moderate pulse. Modern: Failure of the Spleen to control the blood marked by metrorrhagia, metrostaxis, preceded menstruation, profuse menstrual bleeding with light color, prolong menstrual bleeding, and profuse leukorrhea. Gastrodia (Tian Ma, 天麻) and Uncaria (Gou Teng, 鉤藤) calm the Liver and extinguish wind. Haliotis (Shi Jue Ming, 石決明), Gardenia (Shan Zhi Zi, 山梔子), and Scute (Huang Qin, 黃芩) calm the Liver, sedate Yang, clear heat, clear Liver heat, and purge Liver fire. Eucommia (Du Zhong, 杜仲) and Taxilli (Sang Ji Sheng, 桑寄生) nourish the Liver and Kidneys. Cyathulae Root (Chuan Niu Xi, 川牛膝) and Leonurus (Yi Mu Cao, 益母草) activate the blood and direct the blood flow downward. Hoelen with Pine Root (Fu Shen, 茯神) and Polygonum Stem (Ye Jiao Teng, 夜交藤) calm the spirit and tranquillize the mind. Calms the Liver, extinguishes wind, clears heat, activates the blood, and nourishes the Kidneys and Liver. Traditional: Hyperactivity of Liver Yang with internal movement of Liver wind, marked by headache, vertigo, tinnitus, flushing-up, insomnia, a red tongue and a rapid and wiry pulse. In severe cases, numbness, twitching, and spasm in the limbs, or hemiplegia. Modern: Hypertension, cerebrovascular disease, transitory ischemic attacks, epilepsy, neurosis, auditory vertigo, trigeminal neuralgia, Meniere’s disease, facial paralysis, hemiplegia, and hyperthyroidism.